Aspen was built in the 1880s to serve the nearby silver mines. | Photo circa 1900 by Detroit Photographic Co.
Aspen’s Roaring Fork Valley was a summer camping spot for the Ute or Nuchu tribe, nomadic hunter-gatherers who roamed the Western Slope starting in 1000 A.D. Ute Springs, which is near Glory Hole Park at Ute and Original streets, may have been a tribal campsite, according to the Aspen Historical Society. Prospectors arrived in Aspen in 1879, traveling over Independence Pass from Leadville, which was already booming from silver discoveries. The prospectors were drawn to Aspen because the Hayden geological survey in 1873-74 had reported that the Roaring Fork Valley’s outcrops of Leadville limestone also held promise for silver. The prospectors found silver ore on Aspen Mountain and Smuggler Mountain, and their claims became the Smuggler, Durant, Galena, and Spar mines, the state’s richest group of silver mines. Later discoveries also led to high-producing silver mines. The resulting boom prompted B. Clark Wheeler, who had traveled to Aspen by snowshoe over Independence Pass to explore mining investments, to lay out a 282-acre townsite in February 1880 and name it Aspen after the aspen trees that covered the mountains. His platting replaced an earlier one calling the town Ute City. Lots sold for $10 apiece, and about 100 tents and log cabins had been erected by July 1880. Wheeler also built the first road over Independence Pass in 1880-81. His crews used hand tools and manual labor to carve the toll road where a trail had been used by mule trains. The population hit an estimated 2,500 in 1884 and doubled to 5,000 in 1885, with tents and log cabins being replaced by one- and two-story wood frame buildings. Fires in 1884 and 1889 destroyed frame buildings and led to regulations mandating brick exteriors. In 1885, there were 40 bars, plus gambling establishments, two burlesque theaters, and a red-light district along Durant Avenue. But Aspen also was noted for a sophistication not found in other mining boomtowns, with upper-class residents wearing the latest Paris and New York fashions and taking part in such outdoor activities as fox hunting and snowshoe racing. Wealthier residents preferred the larger Victorian-style clapboard homes of west Aspen, notably a stretch of Bleeker Street known as “Bullion Row.” The working class settled in east Aspen, which was characterized by miner’s cottages, clapboard homes a story or a story and a half tall with two to five rooms, a rectangular or “L”-shaped floor plan, a bay window, a gabled roof, and a wooden front porch. Aspen’s silver boom led to a competition between Colorado’s two railroads to provide service to the community. The Denver & Rio Grande Railroad reached Aspen first with a narrow-gauge branch line from Glenwood Springs in late 1887, and the Colorado Midland Railroad completed a tunnel under the Sawatch Range to bring a standard-gauge line into Basalt and then Aspen in early 1888. Two of Aspen’s most famous buildings, the Wheeler Opera House and the 92-room Hotel Jerome, opened in 1889. They were financed by Jerome B. Wheeler, who had been half-owner of the Macy’s Department Store in New York City until 1887 but had become an investor in mines and a smelter in Aspen and in the Colorado Midland Railroad. The lower costs of rail transport spurred mine production between 1888 and 1893 to 10 times the level of the previous years. The railroads also delivered heavy building materials, such as cast-iron storefronts, bricks and stone, and stained glass that fueled a commercial building boom between 1890 and 1892. 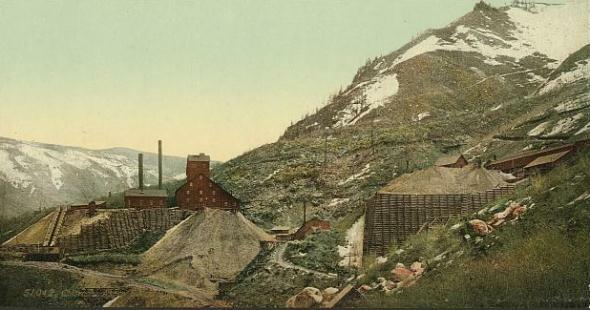 Aspen’s mines achieved peak production in 1891 and 1892, surpassing Leadville as the nation’s most-productive silver-mining district, according to the U.S. Geological Survey. Silver production was spurred by the passage of the Sherman Silver Purchase Act of 1890, which doubled the federal government’s purchases. Aspen hit its peak population in 1893, at an estimated 10,000 to 16,000, but then it was hit hard by the silver crash that same year and nearly died. Most of the mines closed, though the Smuggler reopened and produced a record 2,350-pound silver nugget in 1894. Wheeler, who was Aspen’s largest mining entrepreneur, declared bankruptcy in 1901, and the Colorado Midland Railroad followed in 1906 and removed its rail line in 1920. Aspen’s population, which was 5,108 in the 1890 Census, had fallen to 3,303 in 1900 and 1,234 in 1910 before bottoming out at 705 in 1930. The town’s skiing industry got a major boost after World War II when Walter Paepcke, president of the Chicago-based Container Corporation of America, began plans for a cultural center and Aspen’s first ski lift. In 1946, Paepcke’s Aspen Skiing Corp. opened Lift-1, then the world’s longest chairlift, on Aspen Mountain. In 1947, a remodeled and updated Hotel Jerome reopened, as did a refurbished Wheeler Opera House, which had been boarded up after being severely damaged by an arson fire in 1912. In 1949, Paepcke was instrumental in bringing the Goethe Bicentennial Convocation to Aspen, which spurred the creation of the Aspen Institute and the Aspen Music Festival and School. In 1950, Aspen Mountain hosted the FIS World Alpine Championships, the first sanctioned international competition in the United States. Aspen’s ski industry continued to expand over the next two decades, with the addition of the Buttermilk and Aspen Highlands ski areas in 1958 and the Snowmass ski area in 1969. Buttermilk and Snowmass were developed by the Aspen Skiing Co., while Aspen Highlands was the brainchild of Whip Jones, who in 1993 donated the ski area to Harvard University. The Aspen Skiing Co. runs all four ski areas today. Growth became an issue for Aspen in the 1970s. In 1974, the city and Pitkin County agreed to ban construction above 8,400 feet in altitude to preserve the mountains, and Aspen adopted an ordinance barring new buildings from blocking views of the mountains from downtown. In 1977, the city decided to limit the number of building permits issued each year, with a goal of holding growth to 3.47 percent a year. The growth controls, along with rapidly rising home prices, have spurred concern about the ability of the workers in Aspen’s service-dominated economy to afford to live nearby. Many of them live in Basalt, Snowmass, and Carbondale. Serial killer Ted Bundy came to Aspen in 1975, abducting 23-year-old registered nurse Caryn Campbell from a ski lodge and killing her. He was arrested in 1975 and brought to the Pitkin County Courthouse in downtown Aspen in 1977 for a pre-trial hearing in the case. But he escaped by jumping from second-story window and hid out in the Aspen area for six days before being caught as he tried to drive a stolen car out of town. He was executed in Florida in 1989. The Silver Queen Gondola was added to Aspen Mountain ski area in 1986 as the world’s largest single-stage gondola. The trip to the top of Bell Mountain, which had taken 45 minutes on a series of chairlifts, was cut to 13 minutes. Snowmass added the Cirque lift in 1997, giving it the nation’s longest lift-served vertical rise of 4,406 feet.